Kissimmee Utility Authority will join the state to celebrate Florida Lineworker Appreciation Day on Sunday, August 26 in honor of the men and women who risk their lives daily to ensure reliable delivery of electricity throughout Florida. Florida Lineworker Appreciation Day was designated by the Florida House of Representatives in 2012 in memory of Marc Moore, a lineworker with Lakeland Electric, who was tragically killed while serving his community in 2002. Lineworkers not only serve their own communities, but others across the state and country. When disasters strike, such as last year’s Hurricanes Irma and Maria, lineworkers leave their families and homes to travel to neighboring cities and states – and even abroad – working long hours under dangerous conditions to help restore power. 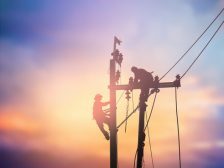 In 2017, the U.S. Bureau of Labor Statistics listed utility line work as one of the most dangerous jobs in the country.